A dramatic cloud swirl, with a blue neon cloud in the center, was sighted and videotaped over the skies of Norway on December 8, 2009. This was sighted over a range of 250 miles, so was not a local affair. Struggling for an explanation, the Norwegian media proffered that perhaps a Russian test rocket had caused the display. The center of the cloud swirl had a neon cloud, also swirling. This neon cloud was similar in appearance to one captured on videotape in China on August 25, 1988. Both were sighted and filmed at night. Russia likewise had a swirling halo cloud overhead above Moscow recently, much discussed in their media. The display over the skies of Norway are not noctilucient clouds, which are ice crystals in the clouds catching the light, nor are they earthquake lights. They are also not the smoking and curling light towers caused by methane gas released during Earth movements, suddenly catching fire while aloft in the sky. The Norway display is akin to the neon clouds seen on occasion since Planet X arrived in the inner solar system in 2003 and the grease in the tail of Planet X has polluted the Earth's atmosphere. The neon appearance is caused by a chemical reaction, akin to man's familiar light sticks. Up until recently, such neon displays required a light source in order to be seen, lit in the dawn or dusk by sunlight or the lights from a city. 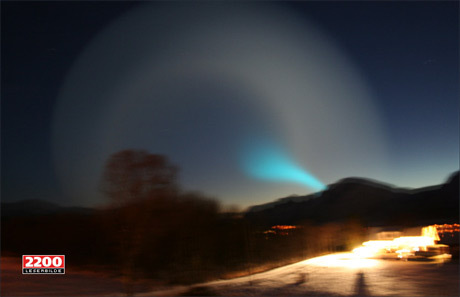 What has occurred over Norway is a neon cloud, a grease cloud, lit by the electrical charge from the tail of Planet X. Why the great swirl in the clouds around the swirling neon display? An electrical charge in the sky is not a static matter, as the path of lightning shows. Lightning is an accumulation between moving air masses that suddenly builds to the point where a torrent of electrons is on the move. But what if the charge does not accumulate in one place, but is constantly present over a broad area? As with all swirls that develop in nature, they start with a small movement in one place that creates a vacuum pulling matter behind it, and thus builds. Galaxies swirl. Water going down a drain swirls. And these large charged atmospheric swirls are chasing after some part of the tail waft that is more or less charged than the surrounding atmosphere. What occurs at the center of such a charged swirl is more electrical charge than the surrounding swirl, thus the center becomes a neon cloud that can be seen even at night, and wants to discharge, ground, in the Earth.